These raised floor tiles are designed with excellent performance and durability in mind. This modular flooring is commercial-grade and is equipped with a low maintenance, high quality 3 mm thick vinyl laminate top surface. The surface comes in 8 designer textures, including wood grain, slate, and white, for a beautiful finish, and is designed so that the flooring looks great, year after year. The vinyl top includes a UV protective coating and is also scratch and wear resistant. These tiles will never need refinishing, minimizing the maintenance and creating a long-lasting surface. These modular floor tiles are an excellent choice if you’re looking for durability. When used in a residence, this modular flooring’s wear layer is rated for 15 years. When used in commercial applications, the wear layer thickness is rated for 7 years. Additionally, the tiles come with a 5-year warranty so you can buy with confidence. The base tray, made of durable polypropylene, is designed for repeated installations without degrading the tile connectors. The unique tile connector system is portable, strong, and stable, so you can use the floor temporarily and then pack it up again when you’re done. This is an ideal feature for temporary dance floors or other flooring that you may need to move and transport, but these tiles are also durable enough for permanent installation, too. One of the major benefits of Max Tiles is that they make great raised floor tiles for basement use. These tiles allow both air and water to circulate beneath them, which can help to speed drying and avoid mold and mildew growth. These non-absorbent tiles are ideal for situations where water may be present, such as if your basement leaks after heavy rain. These modular floor tiles can help you to quickly transform your basement into an attractive, usable space. The tiles create a beautiful finish suitable for a living space, a workspace, or even a multi-purpose area. This modular tile is a popular option for dance floors, both temporary and permanent. Because these tiles can be assembled and removed, you can create a portable, temporary dance floor for events, performances, and more. 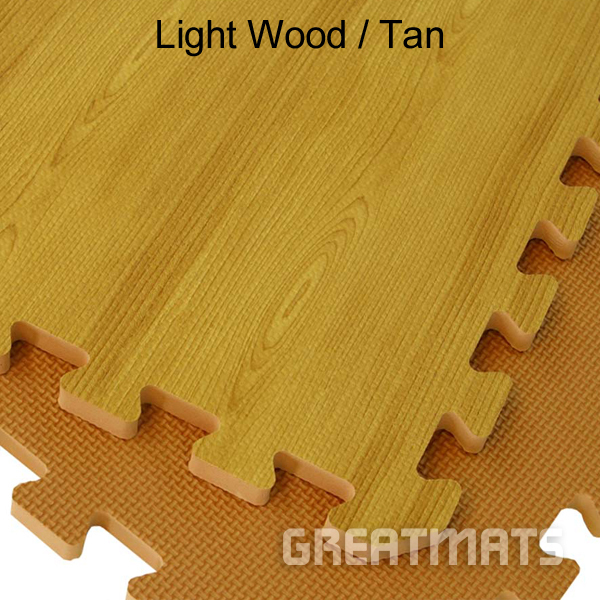 These tiles may be installed over carpeting, however, Greatmats does not guarantee that these tiles are suitable for installation over carpeting, as all carpet is different. These tiles are finished with a low maintenance, high quality 3mm thick vinyl laminate top. This highly durable surface is scratch and wear resistant, and even includes a UV protective coating. These tiles won’t need refinishing and despite hours of practice, they’ll still look great. The durable vinyl laminate top provides plenty of protection against scratching and wear so your new court will continue to look great despite rigorous use. Additionally, you won’t have to worry about the costly investment of repeatedly refinishing the floor. Because these tiles lock together tightly, they’ll hold together and will not separate like other flooring tiles tend to do. Because the tiles are waterproof and allow water and air to flow and beneath them, they’re ideal for bathrooms or kitchens, where frequent spills may happen. They create beautiful, professional floors for other spaces, like dens, bedrooms or hallways. With the available ramped edge pieces, you can create a clean, finished edge if you don’t want to do a wall-to-wall installation. And because installing these tiles is easy, you can floor your rooms yourself without having to bring in a professional. These tiles are durable enough to withstand the weight of furniture, and their vinyl top is UV and scratch resistant, so you can confidently install them even in high-traffic areas of your home. These raised floor tiles can also serve as aerobic and exercise flooring. They’re easy to install and remove, so you can use them as either temporary or permanent flooring in your home. Because these tiles have a durable vinyl protective coating, they can easily withstand repeated use and will still look great. These raised floor tiles are a great option for a DIY project. They easily interlock together with no tools or glue required. To connect the tiles, place them on a hard surface. Then align the tiles with the nubs on top of the loops, and step on the tiles with your foot to lock them together. It’s easy, fast, and simple, and a single person can easily floor a room. When assembling the tiles for a sport or court floor, we recommend using a 3mm to 6mm low-density rubber underlayment for additional cushion, comfort, noise and shock absorption. Avoid using an underlayment in areas where leaks or moisture may occur, like in basements. Greatmats’ new Interlocking Rubber Tile 23×23 Inch x 8mm Eureka will transform any home gym. The Interlocking Rubber Tile 23×23 Inch x 8mm Eureka make for an easy installation process and do not require adhesive to be installed. In general, rubber tiles are much easier to install than rolled rubber flooring. The puzzle-like edges simply lock into each other. This easy installation process allows for anyone to install the floor themselves and eliminates the need to hire outside help. This environmentally friendly flooring is easy to install, making it a fun and fast DIY project. The Interlocking Tile is available in a wide variety of colors and color percentages. The Interlocking Rubber Tiles come in 10%, 15%, 20% color fill, Black, as well as NFL Team colors. These tiles are manufactured to the highest standards and use premium recycled rubber, therefore qualifying the tiles for LEED points. Greatmats Interlocking Rubber Tiles 23×23 Inch x 8mm Eureka are made in the USA with commercial quality standards throughout the entire manufacturing process. The tiles are made with precision cut interlocking joints to ensure that the mats will hold up to the test of time. The secure interlocking system also allows for proper protection of floors and equipment in both home and commercial gyms. These tiles feature full-sized corner and border tiles to allow for the tiles to be installed as an island, all without requiring any cutting. A Made in the USA product, each rubber interlocking 23×23 inch provides 3.67 square feet per tile. This rubber color tile is non-absorbent and features a 5-year limited warranty. 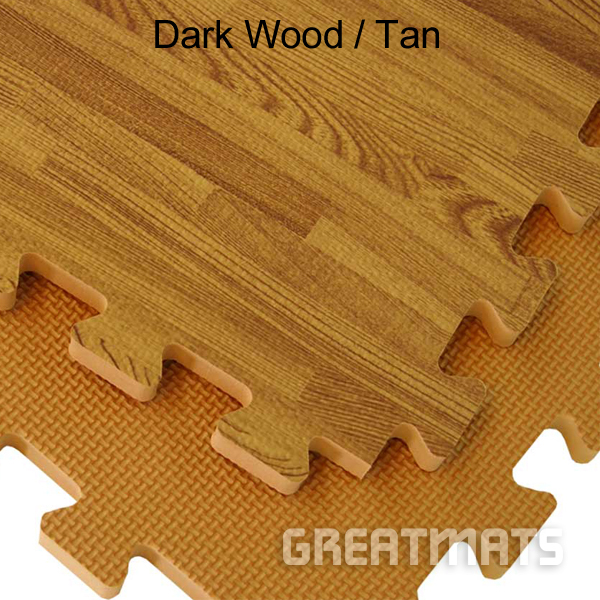 Wood Grain Foam Tiles Reversible combine a wood grain designer look for your floors with a soft and comfortable feel. They are reversible, meaning they feature a tan, thatch texture on one side and a wood grain design on the other. Give your room the great look of hardwood floors while adding the comfort and warmth of interlocking foam tiles. 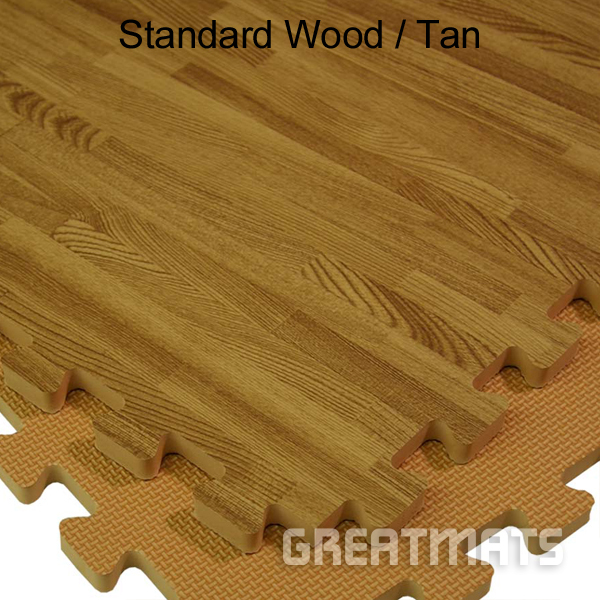 This product is great for basement floors, exercise areas, and trade show booth floors. Each tile measures 2×2 foot x 1/2 inch (13 mm thick). Foam tiles can transform your hard, flat surface into a cushioned and comfortable work or play area. The reversibility of these interlocking floor tiles doubles the usefulness and lifespan of this flooring option. You can use these tiles with either side up. Wood grain floor tiles are lightweight, weighing only 1.2 pound for each tile. The wood look side of this product features a smooth surface while the tan side of the tile features a thatch texture. This thatch surface is durable enough for almost all shoe types except high heels. Interlocking foam tiles are simple to install and require no adhesive or tape. Select an oak wood-grain look, a tan texture, or both for your basement floor, kids room, or family room. Available in three different shades of wood grain. With this interlocking floor tile, you will receive two border strips per tile. This allows you to edge an island layout with a straight edge all the way around the perimeter of your foam floor installation. Allow the foam tiles to acclimate to your room before installation. The foam tiles can expand with changes in heat and humidity; allow at least a 1/4-inch expansion gap for wall to wall installations. Installation is as easy as laying the foam floor tiles down and locking them together. You can easily cut this material with a sharp utility knife to fit the tiles in wall-to-wall installations. Start your installation in a corner, using the provided border strips to reduce the amount of cutting required for a wall-to-wall installation. Both sides will interlock with each other allowing you to have both tan and wood grain sides up at the same time for a checkerboard or other layout design. It is not recommended to place the tiles on top of carpeting as foam tiles can shift especially if furniture or equipment is placed on top or during exercise. High heels will puncture the foam tiles. When used outside, the foam tiles may expand and curl if exposed to direct sunlight in warm climates for extended periods of time. Color and shade may vary somewhat from foam tile to foam tile within the same order. This is common with EVA foam tiles. Both sides of these floor tiles are easy to clean and are durable to common foot traffic. Have your vacuum cleaner set at highest setting or just use hose and nozzle. Test your vacuum first in an area that won’t be noticed. Don’t use the power head. Enjoy the benefits of Home Sport and Play Mats that feature professional quality EVA foam material that is a bit higher durability than basic foam tiles. Use these foam play mats for home martial arts floors, exercise and foam athletic sport flooring. This mat is available in a convenient 2×2 foot interlocking foam tile for home gyms and home sporting or kids’ floors. This foam tile is 20 mm (7/8 inch) thick for more cushioning than thinner mats. Commonly mistaken for rubber floor mats, these heavy-duty EVA foam tiles are softer and safer than rubber tiles for children to play on. They are also softer and more colorful play or exercise flooring than rubber mats. These foam mats also do not have the strong odor that rubber floor mats do. This 20mm foam flooring option is offered in 3 double colored options. Choose from green/brown, red/blue, or black/gray. The reversible interlocking design allows for either color to be up. This allows you to create a checkerboard pattern or other design on your floor. Easily convert any hard surface such as basement floors into a comfortable and safe or sport floor for kids to play and practice taekwondo and karate or other sporting activities. These foam tiles are simple to install even in a wall-to-wall application. The foam mats can be cut with a sharp utility knife and a straight edge. They also come with two border strips for each tile so you can create an island installation. Please Note: Color and shade may vary somewhat from tile to tile within the same order. This is common with this type of EVA foam material. We recommend a checkerboard pattern in your room to alleviate this potential issue. Maintenance: Product can be damp mopped with common household floor cleaners, avoid bleach. Test your vacuum before use. Steam cleaning may heat up the tiles and cause them to expand. Please browse our complete line of puzzle foam floor tiles and play mats. If you have questions please chat with us online, send an email, or call our friendly customer service center to speak with one of our flooring experts about our foam mats.